Non-Destructive Testing (NDT) methods in welding process which can help you to create the expected knowledge within your employee for a high quality of testing & gain the necessary knowledge of codes, standards, and other documents that control the NDT methods being utilized at your company or agency. These courses aim to enhance your capability of testing the welding in different subjects. Prepare students for employment in welding and/or nondestructive examination as entry level technicians. Variety of career opportunities are available to welding technicians and nondestructive examination technicians. Both of these fields are utilized in construction, manufacturing, and transportation industries throughout the world. Employees, trained with NDT methods, can perform effective testing and ensure high quality of products with reduced rejection/waste and increased productivity and user’s safety. Management and supervisory staff who need to understand the potential problems and avoidance procedures for welding and cutting operations. It is especially appropriate for graduate staff who need systematic training in the subject. This Course is designed to prepare individuals with at least one year of industry experience who want to increase their knowledge of inspection and testing techniques as well as associated welding, metallurgy and codes and standards. Ideal candidates for this course include engineers, welders, supervisors and technicians working in the field of non-destructive testing, and anyone interested in the area of welding inspection. The NDT Radiography Testing (RT) Testing Level II training course will provide theory lectures and practical training to provide the candidate with a preliminary understanding of Radiography Testing. At the end of this course the candidate will understand how to perform inspection of samples for Radiography Testing. Basic principles on Radiography Testing. Inspection and measurement of samples. Introduction to ASTM and ASME standards and specifications. At the end of the course, candidate will be appearing for a Level II exam. Each candidate will be a certified NDT RT Level II upon successfully clearing the exam. The NDT Ultrasonic Testing (UT) Testing Level II training course will provide theory lectures and practical training to provide the candidate with a preliminary understanding of Ultrasonic Testing. The course will encourage group discussions around practical problems and provide field expertise on how to resolve them. At the end of this course the candidate will understand how to perform inspection of samples for Ultrasonic Testing. 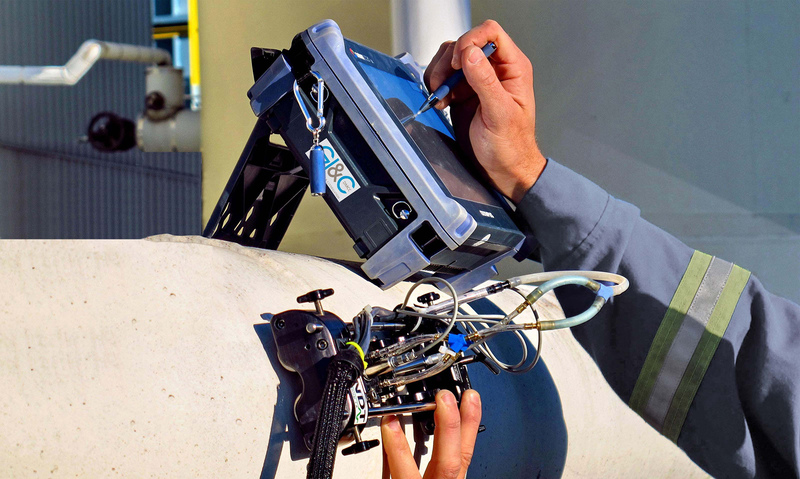 Basic principles on Ultrasonic Testing. The NDT Magnetic Particle Testing (MT) Testing Level II training course will provide theory lectures and practical training to provide the candidate with a preliminary understanding of Magnetic Particle Testing. At the end of this course ,the candidate will understand how to perform inspection of samples for Magnetic Particle Test. Basic principles on Magnetic Particle testing. The NDT Liquid Penetrate Testing (PT) Testing Level II training course will provide theory lectures and practical training to provide the candidate with a preliminary understanding of Liquid Penetrate test. At the end of this course ,the candidate will understand how to perform inspection of samples for liquid penetrate test. Basic principles on liquid penetrate testing. Each candidate will be a certified NDT PT Level II upon successfully clearing the examination. Phased Array Ultrasonic Testing can be effectively used for wall thickness measurements in conjunction with corrosion testing. Its efficiency comes from the combination of many angles and focus depths through to one probe which then performs several different inspections without the need for changing the transducer assembly. The inspection results are clearly stored and displayed for reporting. It can be used on standard and special materials like authenticate and high alloy materials.